GROUND ZERO PLUS 1219 DAYS,--New York, NY, Thursday, January 13, 2005--A robotic space probe is slated to slip into the atmosphere of Titan, the planet Saturn's moon, in search of secrets unlocking the mystery of the universe. Launched by the European Space Agency, the Huygens probe--named after the Dutch astronomer who discovered the moon 350 years ago--will be the first of its kind to settle on the planetary surface of what is called the "frigid realm of the outer solar system." It will take two-and-a-half hours for the probe to descend onto Titan surface, the scientists said. As the imagination of human beings reach deep into space to examine the underbelly of the universe in hopes of unlocking secrets of creation and to further man's thirst to explore deep into the womb of the universe, people are killing one another daily in vicious battles over who is in charge of the planet Earth. In Iraq, more than 1,300 Americans and thousands more Iraqis have died in an interplanetary battle over who is in charge of the surface of the earth. In Sudan, acts of genocide occur while the world blinks its eyes, hoping the rivers of blood will eventually flow past without being seen. 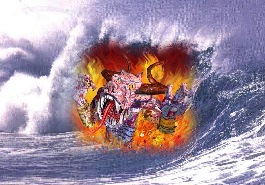 At the same time, Mother Nature ravaged this planet--the third rock from the sun--with a tsunami that reared up out of nowhere and killed tens of thousands. Humans are still scratching their heads trying to figure out how to know when such events happen to protect themselves in the future. On this earth, there are countless "outer reaches" of human mysteries yet to be uncovered and discovered. The most obvious is the internal human "Beast of Terror," that creature within us all that can unleash anger, rage, hatred, violence that turns what some might call civilized human beings into ferocious, primordial beasts ravaging not only others but often turning on themselves and eating their own souls. It is easy to point a finger at a Terrorist who flies a plane into a World Trade Center, or one who drives a truck laden with bombs into a herd of people in Baghdad. However, it is much more difficult to recognize the child molester walking around the community talking, dressing and looking "normal," or to pinpoint the parent who turns angrily to his or her child and spews: "I wish you were never born!" Probing the deep innards of human darkness seems far more a priority than to probe Saturn's moon, Titus. If there are true answers to "ruling" the universe, it must begin first here in the "outer reaches of our own space" rather than millions of miles in the sky. Ironically, the moon being probed in the "frigid realm of the outer solar system" is named Titus after the first gods of Greek mythology. In the story, Zeus was the son of the leader of the Titans and turned on his father. In a great battle, Zeus won and most of the Titans were imprisoned in a place called Tartarus. 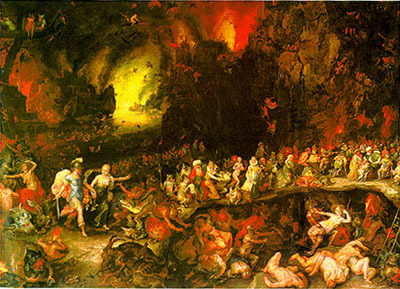 Tartarus, according to myth, was a deep place even beneath the underworld. It was so dark and sunless that its gloom was beyond comprehension. Located below the roots of the earth and sea, to reach Tartarus was to travel the same distance of an anvil dropped from the surface of the earth that would drop for nine days. The prison was spawned from the primordial chaos. Saturn's Titan carries such a legacy of darkness and primordial chaos. The frozen outer reaches of the solar system are being probed by humans, yet the inner primordial and often frozen depths of humanity's Beasts of Terror go unnoticed, unattended. Daily, when humans do not take a Pledge of Vigilance to ward off the primordial Titans of Fear, Intimidation and Complacency, the odds are that they will ooze up from their own Tartarus and spill over into the delusion that we are more civilized than not, wiser than the beasts, more caring than the viper. Probing the inner reaches of the human soul to protect the children from harm and to represent a model for them to protect their children from the Triad of Terrorism--Fear, Intimidation and Complacency--is of far more importance than landing a probe on the surface of Titan. Children by the thousands huddle in the dark of their rooms, fearful of the anger and rage they hear as their parents fight and argue in the other room. Quick, snapping-turtle comments to a child such as: "I wish you were more like....," or, "why can't you do..." and a countless range of other small but deadly raps on a child's self worth and self value drive the child's stock down and build the power of the Beast of Terror. The door to Tartarus is opened not by the child but by the actions of a parent or guardian who forces a child to turn inward where the dark recesses of the inner mind contain the primordial Beasts of Terror--the ones that Zeus banished long ago, but the ones that reappear when least expected. The lesson in all this is Vigilance. If we, as human beings want to really explore outer space, we need first to explore our "inner space." We need to recognize that inside us, each of us, is a Beast of Primordial Terror locked in its Tartarus, sometimes by a thin thread. 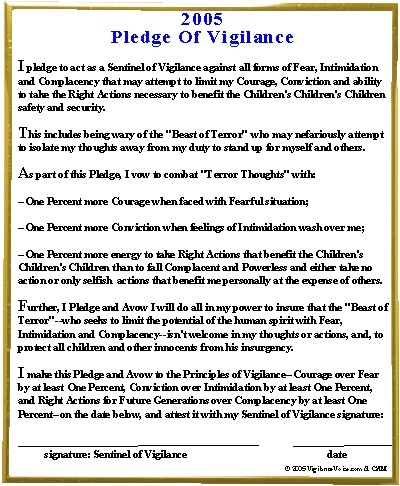 Unless we become Sentinels of Vigilance and vow to protect ourselves from Fear with Courage, from Intimidation with Conviction, and from Complacency with Right Actions for the Children's Children's Children's sake, the odds are we will eat ourselves to death. We will consume not only our own humanness but that of our children. But if we are Sentinels of Vigilance and vow to ward off the dangers of Tartarus, we can use that power to then explore the far reaches of our own inner and outer universe. Fight Tartarus today. Take the Pledge of Vigilance. Go To Yesterday's Story: "Where Does The Terrorism Buck Stop?"